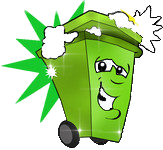 Did you know you could save money, on your wheelie bin cleaning service? Payable every 26 weeks for 2 cleans per month. DISCOUNTED RATE: £2.50 per clean by paying in advance £65.00 = 1 Year, plus 4 FREE CLEANS on any other bins. Equal to 26 cleans. Payable every 5 months for 1 clean per month. Payable every 12 weeks for 4 cleans per month. DISCOUNTED RATE: £5.00 per clean by paying in advance £120 = 1 Year, plus 4 FREE CLEANS on any other bins. Equal to 56 cleans. Payable every 20 weeks for 2 cleans per month. To make a payment please fill in the form below, and click "Submit".